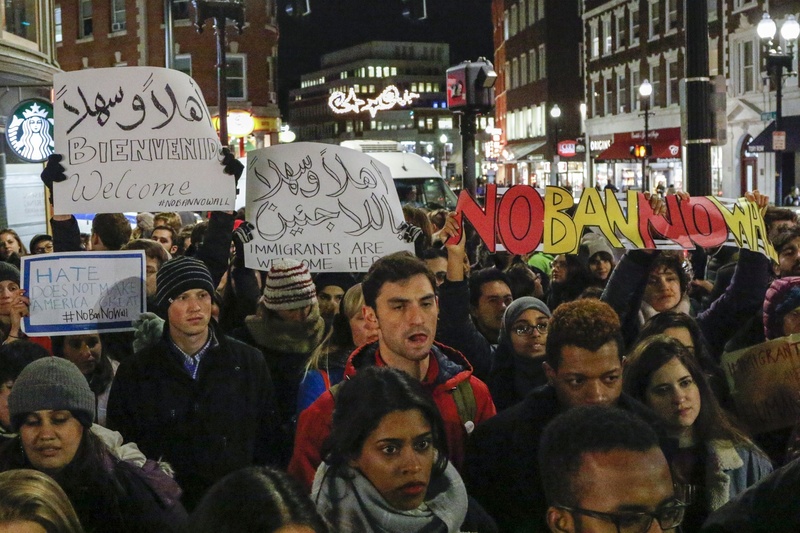 After Immigration Order, Two Harvard Affiliates Barred from Entering U.S.
Demonstrators hold signs opposing President Donald Trump's immigration ban during a rally in Harvard Square Friday. UPDATED: January 30, 2017 at 2:19 p.m.
At least two Harvard affiliates were barred from entering the United States after President Donald Trump suspended immigration from seven predominantly Muslim countries Friday, and the University has warned international students not to leave the country. Iranian scholars Seyed S. S. Saravi, a scientist who had been awarded a fellowship to study cardiovascular medicine at Harvard Medical School, and Samira Asgari, who planned to do research on tuberculosis at the Medical School, could not travel to the United States as a result of the ban. Trump’s executive order suspends immigration from Iran, Iraq, Libya, Somalia, Sudan, Syria, and Yemen for 90 days and bars entry for refugees from Syria indefinitely. 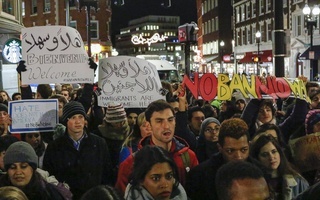 The policy sparked demonstrations and lawsuits across the country over the weekend, including an ‘emergency protest’ held in Harvard Square Friday. In an email, Saravi called working at Harvard his “childhood dream.” Saravi was 16 months into the visa application process when Trump’s executive order tabled his bid Friday. Saravi called the order’s association of Iranians with terrorism “really unfair and unrealistic,” as well as damaging to scientific communication across the globe. Saravi will travel to the United States embassy in Dubai Monday to appeal for a visa. Asgari wrote in an email that she felt “punished for something I had nothing to do with” by Trump’s new immigration policy. She wrote she was standing in line to board her plane at an airport in Frankfurt, Germany on Saturday when a man approached her, introduced himself as a United States official, and told her her visa was not valid for travel. “When I said, ‘But the visa clearly says it is a valid travel visa,’ he replied, ‘Yes, but the rules had changed since this morning,’” Asgari wrote. A federal judge in New York blocked part of the order Saturday night by issuing a temporary stay, which prevents refugees who have already entered the country from being returned to their home countries. Soon afterward, federal judges in Massachusetts, Washington, and Virginia issued similar rulings. The restraining order issued by the Mass. federal court prohibits officials from detaining or returning refugees and valid visa holders trying to enter the country. The ruling is set to expire in seven days. The implications of the order remains uncertain as federal officials determine how to enforce it—White House and Department of Homeland Security officials said Sunday that legal residents could enter the United States. Law professor Gerald L. Neuman, who specializes in immigration law, said the order grants officials some discretion in enforcement, adding to the uncertainty surrounding Trump’s immigration restrictions. Neuman said he believes the order violates the Constitution. “This executive order serves no valid purpose, and is incitement of discrimination against people on grounds of religion, and that should be unconstitutional,” he said. In an email to Harvard affiliates Sunday, University President Drew G. Faust criticized the order and outlined steps the University is taking to support international affiliates and vulnerable student populations, including Muslim students and undocumented immigrants. “Amid this widespread doubt and unease, we will continue to insist that policymakers take full account of how fundamentally our universities depend on the ability of people to travel across borders without undue constraint,” she wrote. The Harvard International Office sent a message to international students Saturday afternoon warning them about traveling outside the United States. “All foreign nationals should carefully assess whether it is worth the risk to travel outside the country,” the message reads. The message also asks students who plan to travel outside the United States to enter their travel information in the Harvard Travel Registry. Morgan reiterated this message and urged any international affiliates whose visas will soon expire to consult an attorney. Representatives from the Law School’s Immigration and Refugee Clinic will present information and answer questions about the implications of the order at a University-wide town hall Wednesday. In addition, Morgan said the clinic is conducting research for lawsuits filed by the American Civil Liberties Union challenging the order. She also emphasized the need for activists to put continued political pressure on lawmakers and enforcement officials to rescind the order. Medical School professor Thomas M. Michel ’77 wrote in an email that Saravi, who was slated to work in his lab, was preparing to travel to Boston to begin research with him when Trump’s order took effect Friday. “Perhaps the suspension of this young scientist's visa might be viewed as an example of the fundamental inequity of Trump's arbitrary and ill-conceived edict,” Michel wrote. Soumya Raychaudhuri, an assistant professor at the Medical School and the head of the laboratory where Asgari was slated to begin work in the next few weeks, said he was considering pursuing legal action to help his student gain entrance to the country. “For America as an open welcoming country that has been the image of a land where dreams come true this is a step back,” Asgari wrote. Looking to the future, Raychaudhuri said he is concerned Trump’s ban on immigration might slow scientific progress in the United States. “Like many labs at Harvard, we have lots of visa holders and we really take pride in the fact that we can get talent from all over the world,” he said. “I’m worrying about it in terms of Samira, but I also worry about what it means for science in America,” he added. Mahmoud Hariri, a doctor from Syria and a participant in the Harvard Scholars at Risk program, said his own ability to travel is relatively uncomplicated, since he does not plan to re-enter the United States after he returns to Syria in June. But he said he and many of his Syrian friends in the United States feel the order has deepened their sense of instability and fear. 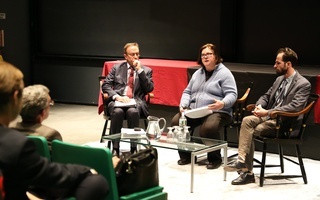 —Staff writer Phelan Yu contributed reporting for this story. Due to an editing error, a previous version of this story misspelled the name of Physics Department chair Masahiro Morii. A previous version of this story misspelled the name of Maggie Morgan, a fellow at the Harvard Law School Immigration and Refugee Clinic. On Feb. 8, the Harvard Arab Students Association hosted a "teach-in" with legal analysts in response to President Trump's travel ban. Using immigrants for economic stimulus then failing to create a suitable living environment for them has become a hallmark of Midwestern legislation.